Calling All Young Musicians in Encinitas! The stage is set for the young musicians of Encinitas to compete for a spot at this year’s Summer Fun on the 101: Leucadia’s Music Festival. 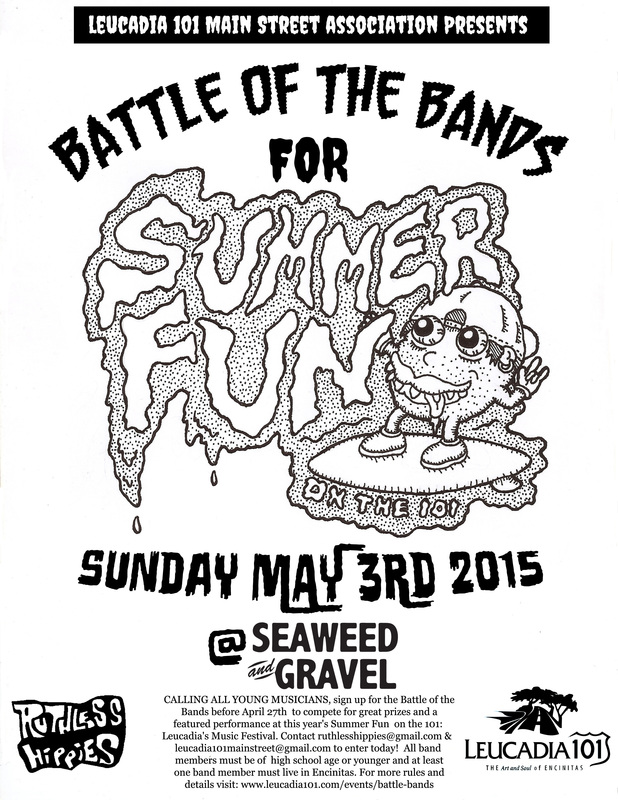 On Sunday May 3rd at Seaweed and Gravel, each band that enters will have twenty minutes on stage to impress the judges and audience. At the end of the concert, our expert panel of judges will choose one band, and a second band will be chosen by audience vote. These two bands will win special prizes and the opportunity to play at this year’s Summer Fun on the 101: Leucadia’s Music Festival being held on June 26th and 27th, 2015. If you think you’ve got what it takes, send us your band’s name, band members’ names, ages and school of your band members with proof of school enrollment and age, (at least one member of your band must show proof of living in the City of Encinitas and no band members may be older than high school age. Written consent from a parent or guardian is needed for any contestants enrolled in elementary school. Please send all the required information and copies no later than April 27th, 2014. Include an e–mail address, phone number and mailing address so we can contact your band. You must include a recording of your band in one of the following formats: a link to a streaming video or recording on the web; an Mp3 or other universal digital format; or a physical CD recording. Info and music can be e–mailed to: ruthlesshippies@gmail.com and info@leucadia101.com. Please send to BOTH email addresses and wait one day for confirmation reply. OR they can be mailed or hand delivered to the L101 office at 386 N Coast Hwy 101 Encinitas 92024. Info regarding equipment and set times for the day of the event will be sent out to all participating bands on April 28th. Call 760 .436 .2320 or e–mail info@leucadia101.com if you have any questions regarding the event. Entries will be accepted on a first come, first served basis. ROOM IS LIMITED, so send us your application materials and details ASAP!